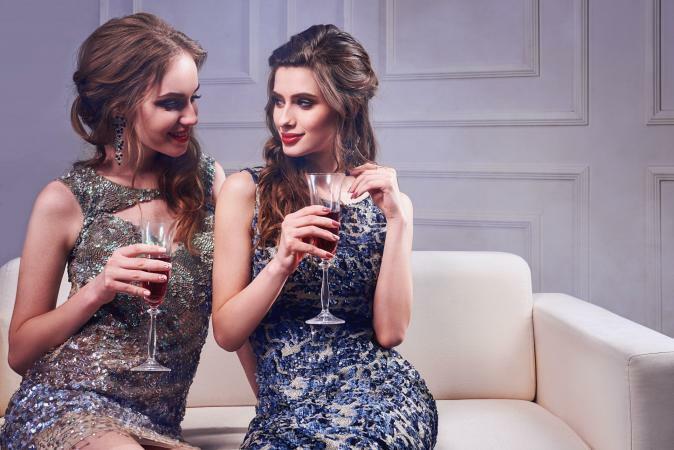 During the 1920s, newfound concepts of individuality and a repudiation of the Edwardian matronly ideal of respectable womanhood gave rise to the new phenomenon of the "Drinking Woman," who dared to enjoy cocktails in mixed company (Clark, p. 212). She emerged at private cocktail soirées and lounges, and the cocktail dress, as a short evening sheath with matching hat, shoes, and gloves was designated to accompany her. The cocktail affair generally took place between six and eight P.M., yet by manipulating one's accessories, the cocktail ensemble could be converted to appropriate dress for every event from three o'clock until late in the evening. Cocktail garb, by virtue of its flexibility and functionality, became the 1920s uniform for the progressive fashionable elite. By the end of World War I, the French couture depended rather heavily on American clientele and to an even greater extent on American department stores that copied and promoted the French créateurs (Steele, p. 253). As cocktailing had originated in the United States, the French paid less attention to the strict designations of line, cut, and length that American periodicals promoted for their heure de l'aperitif. Instead, the couturières Chanel and Vionnet created garments for the late afternoon, or "after five," including beach pajamas-silk top and palazzo pant outfits worn with a mid-calf-length wrap jacket. Louise Boulanger produced les robes du studio, chic but rather informal sheaths that suited the hostess of private or intimate cocktail gatherings. As the popularity of travel grew, both in American resort cities like Palm Beach, "the Millionaire's Playground," and abroad with the luxury of the Riviera, these French cocktail garments gained favor in wealthy American circles. But while America's elite were promoting the exclusive designs of the French couture, the majority of the United States relied on the advertisements of Vanity Fair and American Vogue, as well as their patronage of American department stores to dress for the cocktail hour. Created by Chanel in 1926, the little black dress was translated to ready-to-wear as a staple of late afternoon and cocktail hours; American women at every level of consumption knew the importance of a practical "Well-mannered Black" (Vogue, 1 May 1943, p. 75). Mid-1920s skirt lengths were just below the knee for all hours and affairs. Though cocktail attire featured the longer sleeves, modest necklines, and sparse ornamentation of daytime clothing, it became distinguished by executions in evening silk failles or satins, rather than wool crepes or gabardines. Often the only difference between a day dress and a cocktail outfit was a fabric noir and a stylish cocktail hat. Hats in the 1920s varied little from the cloche shape, but cocktail and evening models were adorned with plumes, rhinestones, and beaded embroideries that indicated a more formal aesthetic. Short gloves were worn universally for cocktail attire during this period and could be found in many colors, though white and black were the most popular. In the early 1930s, Hollywood sirens like Greta Garbo embodied a casual, sporty American chic that paired easily with the separates ensembles favored by the French. The more privatized cocktail party of the silver screen began to gain popularity, replacing the smoking rooms of Paris and the dance clubs of New York. The stock market crash of 1929 and the resulting economic depression dictated that it was no longer fashionable to display wealth by throwing ostentatious public affairs. Exclusive lounges emerged rapidly on the Paris scene; Bergère, the Blue Room, and Florence's were as popular for after-dinner cocktails as for the private affairs of the early evening. Dames du Vogue like Vicomtesse Marie-Laure de Noailles and Mrs. Reginald (Daisy) Fellowes, members of the elite international café society, became notorious for their exclusive soirées. Their patronage of Chanel, Patou, and Elsa Schiaparelli, all made famous by separates designs, helped popularize day-into-evening wear for upper-class Parisians and American socialites. While Mademoiselle Cheruit had her smoking, a fitted jacket ensemble for early evening affairs, Schiaparelli was the most famous purveyor of the cocktail-appropriate dinner suit. Her suit consisted of a bolero or flared jacket that could be removed for the evening, revealing a sleeveless sheath dress. Unlike the previous decade, the 1930s dictated different skirt lengths for different hours: the silk, rayon, or wool crepe sheath of the dinner suit was steadfastly ankle or cocktail length. In light of the economic hardships of the early 1930s, American designers like Muriel King designed "day-intoevening" clothes by championing a simple, streamlined silhouette and emphasizing the importance of accessories. Cartwheel hats, made of straw or silk and decorated with velvet ribbons or feathers, and slouchy fedoras of black felt were equally acceptable for the cocktail hour. Gloves were a bit longer than in the previous decade, but were still mandatory for late afternoon and evening. Costume jewelry, whether as a daytime pin or an evening parure, became the definitive cocktail accessory. Excessive jewelry was promoted as both daring and luxurious when clothing itself was regulated to be modest and unfettered. During World War II, the hemline of the cocktail dress rose again to just below the knee, but the convenience and accessibility of the fashionable cocktail accessory sustained. Parisian milliners like Simone Naudet (Claude Saint-Cyr) produced elegant chapeaus with black silk net veils for the cocktail hour. In New York, Norman Norell attached rhinestone buttons to vodka gray or billiard green day suits to designate them cocktail ensembles. By the mid-1940s, cocktailing was made easy by the adaptability of cocktail clothing and the availability of the indispensable cocktail accessory. With his New Look collection of 1947, Christian Dior brought romanticism back to the catwalk. His cinched waists and full, mid-calf length frocks enforced a demure feminine aesthetic (Arnold, p. 102). The cocktail hour began to represent universal social identities for women: the matron, the wife, and the hostess. Cocktail parties rose to the height of sociability, and cocktail clothing was defined by strict rules of etiquette. While invitees were required to wear gloves, the hostess was forbidden the accessory. Guests were obligated to travel to an engagement in a cocktail hat (which had retained the veil made popular in the 1940s), but they were never to wear their hats indoors. Parisian cocktail dresses were executed in black velvets and printed voiles alike, but they all retained the short-length of the original 1920s cocktail dress. American designers like Anne Fogarty and Ceil Chapman emulated the "New Look" line, but used less luxurious fabrics and trims. Dior, along with Jacques Fath and milliners Lilly Daché and John-Fredericks, quickly saw the advantages of promoting cocktail clothing in the American ready-to-wear market, designing specifically for their more inexpensive lines: Dior New York, Jacques Fath for Joseph Halpert, Dachettes, and John Fredericks Charmers. Dior was the first to name the early evening frock a "cocktail" dress, and in doing so allowed periodicals, department stores, and rival Parisian and American designers to promote fashion with cocktail-specific terminology. Vogue Paris included articles entitled "Pour le Coktail: L'Organdi," while advertisements in Vogue out of New York celebrated "cocktail cotton" textiles (Vogue Paris, April 1955, p. 77). Cocktail sets, martini-printed interiors fabrics, and cocktail advertisements all fostered an obsessively consumer-driven cocktail culture in America and, to some extent, abroad. Though Pauline Trigère, Norman Norell, and countless Parisian couturiers continued to produce cocktail models well into the 1960s, the liberated lines of Gallitzine's palazzo pant ensembles and Emilio Pucci's jumpsuits easily replaced formal cocktail garb in privatized European and American social circuits. Often direct appropriations of midcentury designs, the cocktail dress and its partner accessories exist today on runways and in trendy boutiques as reminders of the etiquette and formality of 1950s cocktail fashions. See also Gabrielle (coco) Chanel; Christian Dior; Little Black Dress. Arnold, Rebecca. Fashion, Desire, and Anxiety: Image and Morality in the Twentieth Century. New Brunswick, N.J.: Rutgers University Press, 2001. Clark, Norman H. Deliver Us From Evil: An Interpretation of the American Prohibition. New York: W. W. Norton and Company, 1976. "Dior's Convertible Costumes." Vogue (1 September 1951): 183a. Kirkham, Pat. Women Designers in the USA 1900-2000. New York: Yale University Press, 2000. "Les Décolleté de sept heures." Vogue Paris (September 1948): 141. "Les Pyjamas et les robes du studio." Vogue Paris (June 1930): 47. Milbank, Caroline Rennolds. New York Fashion: The Evolution of American Style. New York: Harry N. Abrams, 1989. Seeling, Charlotte. Fashion: The Century of the Designer, 1900-1999. Cologne, Germany: Konemann, 1999. Steele, Valerie. Paris Fashion: A Cultural History. New York: Oxford University Press, 1988. "The Well-Dressed Woman." Vanity Fair (June 1928): 87.